Nintendo famously opened the floodgates for demand of new characters in Super Smash Bros for Wii U and 3DS with an open poll to vote for your favorite nominees. There have been plenty of recommendations, both probable and obscure, but virtually anyone can be a candidate given the open nature of the ballot. However, some folks are never going to make it to the big leagues no matter how much of a chance you give them. Despite being owned by Nintendo, I’m willing to bet that not one of the following five characters received even a single vote. Even while living in a world where Tingle and Lanky Kong can be considered viable contenders, there are some guys who just can’t catch a break. Thankfully, the polls are already closed and there’s no chance of you readers voting for these losers just to troll me. 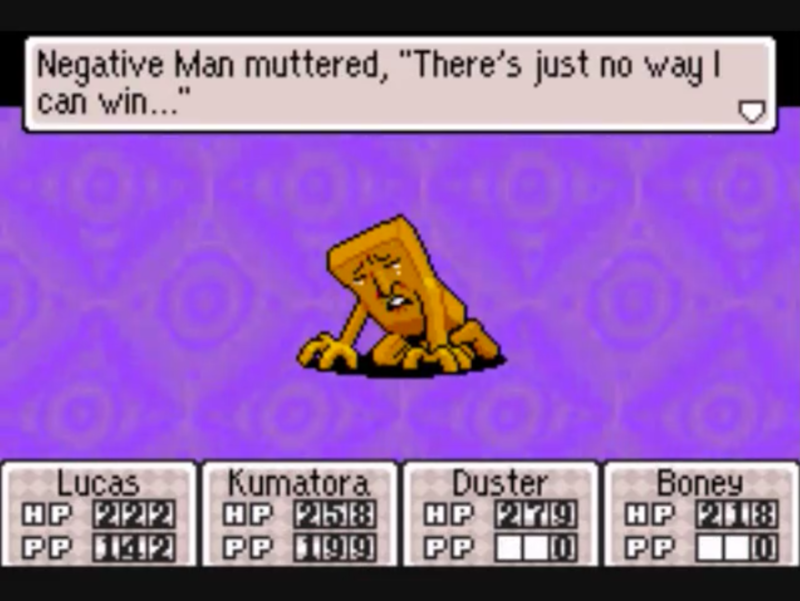 The Mother/Earthbound series is famous for its quirky sense of humor, and perhaps the best example of it is the fight in Mother 3 against Negative Man. Negative Man is aptly named as he is a being of pure negativity… That is, he suffers from crippling depression and spends most of the battle spouting melancholy phrases to himself. Those downer quotes of his aren’t contextualizing some debuff he’s casting on you, he is literally just crying at himself in a corner for no particular reason. Even when he finally does work up the courage to throw a basic attack, he’ll only deal one point of damage regardless of the level you’re at. Fighting him is almost like the reverse of going up against an over-powered boss that you haven’t prepared for in the slightest. The real challenge would be losing a fight with this guy on purpose, but I think he would implode from his own anguish before you could even pull that off. It’s actually pretty cruel when you really think about oh, hey, he dropped a meteotite. 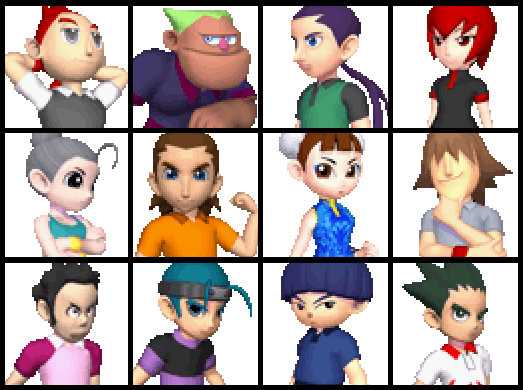 Did you know that Mario Tennis: Power Tour had a grand total of 38 playable characters? That’s the largest line-up in the history of the series! How is it that the Gameboy Advance was able to pack in that many characters while the upcoming Wii U game only has sixteen? Well, the answer is that most of the characters are random losers that the developers probably threw together in a single afternoon. Only six of the playable characters are actual Mario characters while the rest look like cheap, fan-made OC’s created for something other than Mario. While Waluigi was also created for the Mario Tennis series, at least he remotely looks like he belongs in the Mario universe. Everyone that Power Tour introduced looks like someone out of a generic sports anime that was cobbled together on a shoe-string budget. Also, more than a third of the cast isn’t even capable of performing power shots, making them worthless. I tried to single out one specific character as the absolute worse, but they just seemed to blend together into an unholy sludge of desperation the more I thought about them. Still, there are a few highlights among the cast that warrant a brief mention. There’s Flit, who looks like a low-budget Sasuke cosplayer, Sass, whose body is 75% chin, and Skipper, who is a guy dressed in pink and named Skipper. There’s even one named Roy and we all know how much Smash could use another one of those. Hey, remember that time where Mario made shady purchases from a smelly hobo with a lightbulb coming out of his head? I sure do! 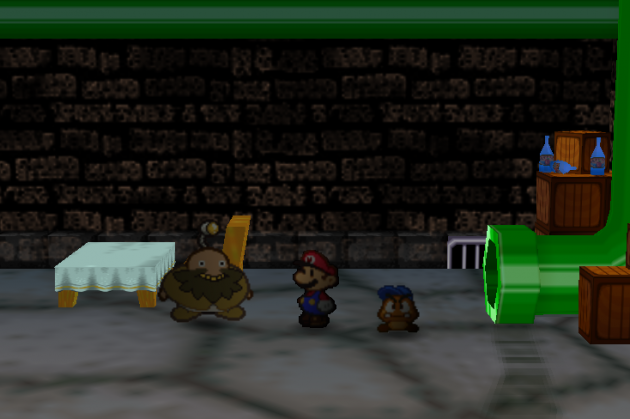 Rip Cheato appears in Paper Mario living in the sewers beneath the Mushroom Kingdom. This Hagrid lookalike with a name that makes him sound like a Chester Cheetah replacement for the MLG crowd makes a living by selling mystery prizes at the uniform cost of 64 coins. That’s a decent price to be paying in this game, especially when it only gets you the single worst healing item in the game. However, you have to go through his lousy prizes because it’s the only way you can get rare collectibles, including a one-of-a-kind equipment item. It’s actually a fairly ingenious scheme, even if it can only really work on RPG protagonists. Also, running into a homeless man with a thousand-yard stare and grinning through half a set of teeth who’s selling foul shrooms in the sewers of the otherwise idyllic Mushroom Kingdom is akin to finding a dead body in Disney Land. It’s incredibly surreal, even though it should make sense. Well, except for the lightbulb part, that’s still weird. There are literally hundreds of Pokémon that could make for potential fighters, but there are also plenty that even the most die-hard Pokémon fans wouldn’t wish to see in Smash‘s roster in a hundred years. You might have expected Magikarp to take this spot, but that floundering wimp would at least have great comedic value. Unown, on the other hand, is weak to the point of not even being funny. 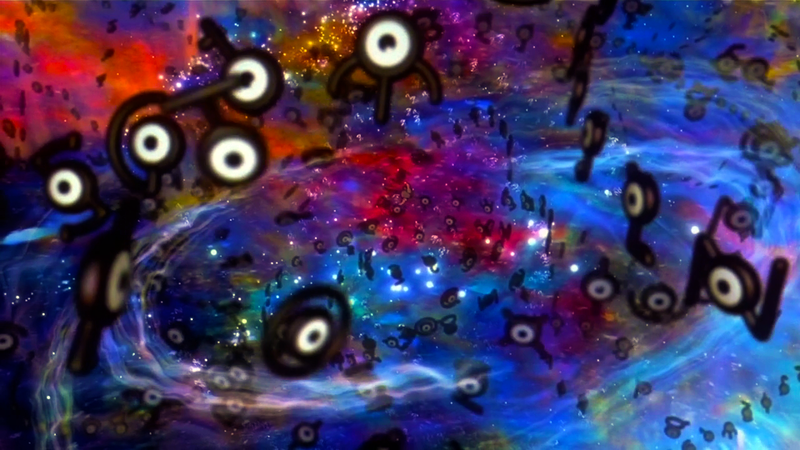 Those of you only familiar with Unown from their appearance in the third Pokémon movie may feel confused, thinking that Unown is some legendary Pokémon possessing incredible power. In the games, Unown are actually easier to catch than the notoriously abundant Zubats and are more useless than Magikarp. Unown can only learn one move, Hidden Power, which is an attack that can only be learned by literally every Pokémon in existence. Yeah, you have to go out of your way to teach it to most other Pokémon, but it barely does any damage anyway so why would you bother? The only notable thing about the Unown is that they have the gimmick of coming in different shapes for every letter in the alphabet. If you’re honestly going to go through with catching each kind of these worthless pieces of junk (a feat that goes completely unrewarded), then you may want to see a therapist about your level of “Gotta catch ’em all” mentality. Well, I suppose it is cheaper than amiibos. What am I even looking at?! That came from a Mario game? Not even from some obscure educational game that Nintendo licensed out to some no-name studio in the early 90’s, but from Super Mario Galaxy 2? How? 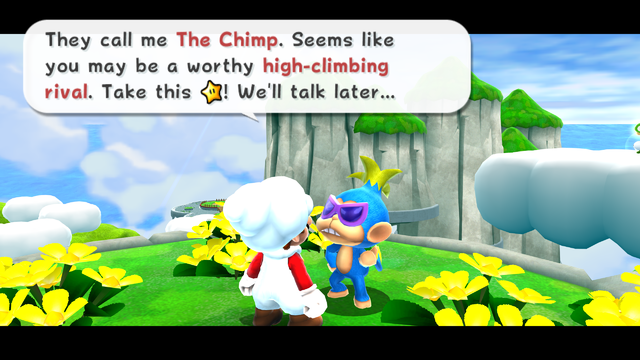 The Chimp was introduced in Super Mario Galaxy 2 for its rendition on timed challenges where you race against an NPC to win a valuable collectible. How is it that Nintendo was able to create a substantially more endearing character by recycling a basic enemy model and labeling him ‘Koopa the Quick’ in Super Mario 64 than when they actually went out of their way to design something? The Chimp looks like someone that Poochie from The Simpsons would call a tool. Just about the only thing interestingly about the twerp is how increasing ridiculous his various names get in different localizations. Italy pretty much hit the nail on the head with Loafer Monkey, France knows him as Billy Banana, but his original Japanese name achieves a new level of selling-out by calling him the Wandering Playmonkey. Sadly, no version of the game refers to him by my favorite name for the little dweeb, “Sin Against Nature”. I sincerely hope that this list made for an enjoyable waste of your mortality. Who do you NOT want to see make it to Smash‘s roster? Who is the lamest character to ever appear in a Nintendo game? Leave a comment below and let us know what you think.